Brian Romans is a scientist sailing aboard Expedition 374. He will blogging on his home institution’s – Virginia Tech – website here, and we will re-post his updates. Below are his first two posts, from October 19 and January 7. You can also follow Dr. Romans on Twitter and Instagram. Originally posted January 7, 2018 on the Virginia Tech Sedimentary Systems Research blog. I’ve been in Lyttelton, New Zealand (port town close to Christchurch) the past few days during our port call. The science party typically boards and moves onto the JOIDES Resolution (the JR) during port call to begin getting familiar with the ship, the labs, the people, and more before we actually depart. Meanwhile, the crew for the ship is offloading cores (and other freight) from previous expedition and preparing for the new expedition. All this typically takes a few days, which allows the scientists to get off the ship in the afternoons/evenings. We set sail in just a few hours and it will be an ~8-day transit to our first coring site in the Ross Sea. During this transit we will continue to work in our lab groups (more about all that in a subsequent post) and get ourselves ready for the first core on deck. Being able to get off the ship also allows getting a view looking back at the JR from off the ship, which is something we won’t be able to do for two months. What a beauty! Finally, just wanted to point to this very nice story by the College of Science communications team that was posted on Virginia Tech News the other day. This is a wonderful overview of the objectives of the expedition. 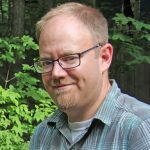 Originally posted October 19, 2017 on the Virginia Tech Sedimentary Systems Research blog. I’m very excited to announce that I will be participating as a shipboard scientist on International Ocean Discovery Program (IODP) Expedition 374. This expedition leaves Christchurch, New Zealand on January 4th and will spend several weeks in the Ross Sea, offshore western Antarctica. 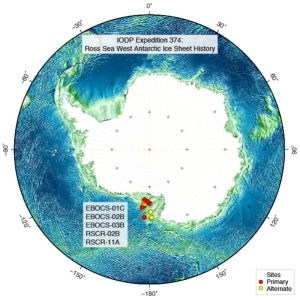 The Ross Sea West Antarctic Ice Sheet (WAIS) History Expedition will investigate the relationship between climatic/oceanic change and WAIS evolution through the Neogene and Quaternary. Numerical models indicate that this region is highly sensitive to changes in ocean heat flux and sea level, making it a key target to understand past ice sheet variability under a range of climatic forcings. The proposed drilling is designed to optimize data-model integration for improved understanding of Antarctic Ice Sheet mass balance during climates warmer than present. Core and log data from a transect of six sites from the outer continental shelf to rise in the eastern Ross Sea will be used to: (1) evaluate WAIS contribution to far-field ice volume and sea level estimates; (2) reconstruct ice proximal atmospheric and oceanic temperatures to identify periods of past polar amplification and assess forcings/feedbacks; (3) assess the role of oceanic forcing (e.g., sea level, temperature) on WAIS instability; (4) document WAIS sensitivity to Earth’s orbital configuration under varying climate boundary conditions; and (5) reconstruct eastern Ross Sea bathymetry to examine relationships among seafloor geometry, ice sheet instability, and global climate. 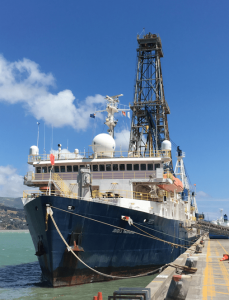 I am thrilled to be participating in this exciting expedition and looking forward to expanding the scope of the Sedimentary Systems Research group into ice sheet and glacially influenced marine sedimentary processes as well as investigating paleoceanographic records of the Miocene and Pliocene. I will be posting to this site throughout the expedition, so stay tuned for updates from the JOIDES Resolution.